For HAMA8, we’re pleased to be bringing back our friends from Pachinko Fever, the Interactive Pachinko Parlor! It’s like Peggle, but real! 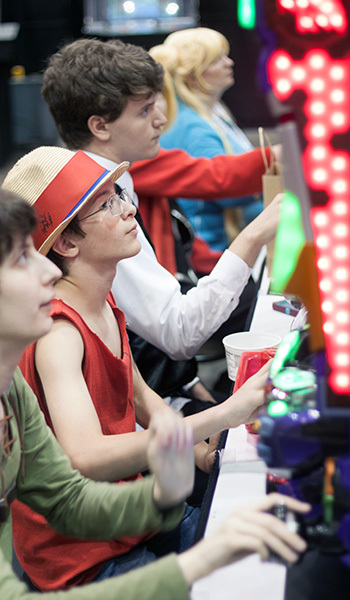 Back in 2009, they bought their first pachinko machine for engaging fans at their convention table. Shortly after that, Jared was bitten by the pachi bug, and now owns 14 machines, in various stages of restoration. Pachinko is Japanese pinball, Japan’s favorite pastime. Its been one of their most popular leisure activities for nearly a hundred years. Pachinko Fever sets up an interactive parlor that works just like it does in Japan (minus the Yakuza, of course), where you buy balls to play with, and redeem your winnings for prizes much like an American arcade. Their machines represent the history and evolution of pachinko over the last 55 years with machines dating from 1961 up to 2010, so we have a machine for everyone! Come try your hand at some great prizes and experience this really fun part of Japanese culture first hand with Pachinko Fever! You can also find them on Facebook at https://www.facebook.com/PachinkoFever as well as their own website at http://pachinkofever.org!